Native species are usually the first plants birds turn to for food and cover. In addition to being favored by birds, they are a good choice for the gardener as they thrive in local soils. Back to Nature suggests offering birds a mix of evergreens and deciduous shrubs in order to provide cover and shelter year round. Some of our favorites include: Bayberry, Chokeberry, Serviceberry, Winterberry, American Holly, Cotoneaster, Blueberry, Pyracantha, Viburnum, Fringe Tree, and Sumac. Ornamental grasses coupled with perennials not only look beautiful, but are a great safe haven for birds. This combination provides nice winter interest to your garden, while their seeds provide an important source of food and their plumes a great nesting material. An important consideration for birds is a water source for drinking and of course, bathing. A bird bath can provide hours of entertainment while providing a key element for the birds. 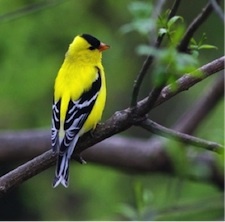 Bird houses can allow you to attract Bluebird, Chickadee, Nuthatch, Wren, Tree swallow, Flicker, Owl, and not to mention the New Jersey state bird, the Eastern Goldfinch. If you want to keep the goldfinch around, be sure to plant Sunflowers and Echinacea. In the fall, their tasty seed heads will be enjoyed! Last but not least, a simple brush pile can offer protection from predators and shelter from severe weather. It is also something you can put together without spending a dime. Once your bird friendly yard is in place – don’t forget the most important consideration. Chemical fertilizers and insecticides have negative effects on birds as well. A poisoned caterpillar becomes poisoned bird food. Contaminated water supplies can be ingested by birds (and humans!). Be sure to use only organic pesticides and fertilizers – and always be certain to follow the directions. Back to Nature can help you with your organic "birdscaping" needs and also help you accessorize the beautiful habitat you have created. Remember to let us know you are a member of The Friends of The Frelinghuysen Arboretum and we will extend a 10% discount to you!